Barry Geraghty won his first Irish Grand National by guiding the Jonjo O'Neill-trained 8-1 favourite Shutthefrontdoor to an exciting win at Fairyhouse. 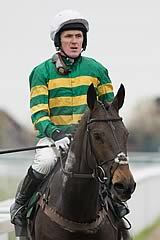 Geraghty got the ride as champion jockey AP McCoy, the usual first choice of owner JP McManus, was suspended. It was a second Irish National success for O'Neill and the first victory by a favourite in the race for 15 years. Golden Wonder was second with Saoirse Dun taking third place. Trainer O'Neill had last triumphed in the 2007 renewal with Butler's Cabin. His latest hero had looked a novice chaser to follow in the early stages of this season but made mistakes as one of the leading contenders for the National Hunt Chase at Cheltenham and had finished only sixth. Geraghty was close to the pace and travelling well for most of the three miles and five furlongs. But the Dessie Hughes-trained Golden Wonder made an attempt to slip the field at the home turn and it was only on the short run-in that Shutthefrontdoor poked his head in front as Golden Wonder settled for second, just ahead of Saoirse Dun and Jamsie Hall. "I thought I was in trouble two from home but it came good," said Geraghty whose brother Ross won the race on Bunny Boiler in 2002. "I live just a mile down the road and this means a lot to me." O'Neill said: "He was in a great position all the way and jumped really well. Everything went right for him. He has done nothing wrong all season. "He had a great run at Cheltenham and after that we thought this was the race for him. Plan B didn't work out too badly! "He will have good rest and is hopefully OK and we can look forward to next season. He needed a big leap at the last, he got it and battled on really well."